Kevin Mellott has announced MultiBoy 32, the first ever Virtual Boy multicart! It comes equipped with an SD card slot and can store up to 32 games of up to 32 Mbit each on its internal 1 Gbit flash chip. A battery-free MRAM chip adds standard-sized SRAM for each of the 32 game slots, and is connected through a full 16bit bus width instead of the production 8bit width. Flash space: 32 slots of 32Mbit RAM via a 1Gbit Flash. RAM space: 256k x 16 SRAM space (8k x 16 per slot) using MRAM (no battery needed). Full 16bit SRAM bus instead of the production 8bit width. On board 32bit microcontroller (MCU) for programming slots. USB input for interfacing and control. Games loaded via SD card slot. On screen game selection themed around my 8bit VB character Do-Do. Arduino compatible MCU (custom firmware development if you're so inclined). The cart should be out this summer, at a price of around a reasonable $150. But the price ultimately depends on the number of preorders, so make sure to share your enthusiasm for this amazing piece of hardware! Check out the announcement thread for all the yummy info. Superstar VB homebrewer Martin Kujaczynski has just launched an indiegogo crowdfunding campaign in order to be able to spend the rest of the year finishing up his VB Music Tracker, the respective sound player code, as well as new game called "Bombenleger", that bears a striking resemblence to Bomberman. Most homebrew games and demos for the Virtual Boy have inferior sound and music due to the lack of proper sound tools. To change that fact I started the development of a music tracker that will allow developers and composers to create high quality music for the Virtual Boy. At the moment the tool is half-finished. If the funding campaign is successful, I will spend the next few weeks working full time on the project to complete it till the end of December. To raise interest in the campaign I decided to pair it with the development of a small but fun game for the VB. It's similar to a well know game, where you have to make your way through a labyrinth by placing bombs to destroy walls and defeat enemies. The campaign will run for a week only two weeks and requires €1,200 to be raised. Let's make is a success! See all the info here. Rustual Boy is a Virtual Boy emulator. It can be used to play existing Virtual Boy games, as well as be a helpful development/debugging tool for homebrew for this platform. The name "Rustual Boy" is a portmanteau of the words "Rust" and "Virtual Boy". Ok, the "Virtual Boy" part was obvious, but why "Rust"? In fact, Rustual Boy is written in the Rust programming language - a "systems programming language that runs blazingly fast, prevents segfaults, and guarantees thread safety." Rust is a wonderful language with a thriving community, and as such provides a fantastic platform for an emulation project! Digital Foundry have published a video feature about the Donkey Kong Country series that features behind-the-scenes stories from some of the games' developers. It includes a brief section about Rare's experiments on a Virtual Boy version with quotes by Environment Art Director Steven Hurst. Read on for a full transcript under the video. For the last year ive been away from DCEmu and once you step away its hard to get back but I decided a while back that its time to go back to basics and condense all the sites as far as I can, get rid of meaningless sites and then when I have it all as I want it, get back to newsposting like I used to years ago, with that in mind, all our Nintendo News is now going to be under one site, that means all the DS, 3DS, Wii, Wii U, Gamecube, N64, Snes, GBA, NES, GBC, GB and any future news will all be together. When I start posting news again we will host our files also and get back to the good old days. Nintendo announced a Super Smash Bros. for Wii U bundle that includes a Gamecube controller and more importantly an adapter to plug Gamecube controllers into Wii U. This bundle, according to Amazon, will cost $99.99.Nintendo has not set official pricing for the package and have not said if the Wii U Gamecube controller adapter will be sold separately.Super Smash Bros. for Wii U will be released sometime in 2014. The Nintendo 3DS version is scheduled to come out on October 3 in North America. Siliconera has been playing Super Smash Bros. for Nintendo 3DS and will have impressions soon. Today our GBA News site has had a revamp up to our latest revision and we have added more features that cover our core subjects which are Gameboy, Gameboy Colour, Gameboy Advance and Virtual Boy. 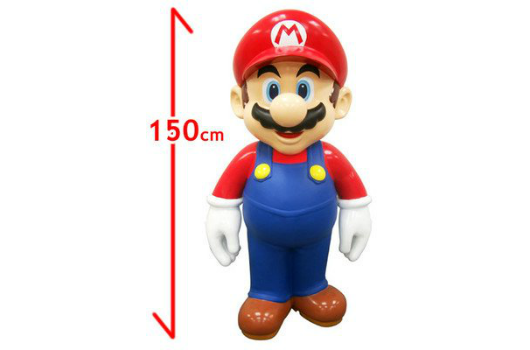 Whether you're the owner of a local gaming shop or the parent of the world's most spoiled child, now you, too, can make a sizable investment in the momentary, fleeting happiness of a youth with this "life-size" Mario statue. Available for ¥285,000 (about $2,900) from Amazon Japan, the statue stands five feet tall and is made from fiber-reinforced plastic. There aren't really any bells or whistles to speak of, what with it being a statue and everything, but it doesgive the owner a reference point for extrapolating the heights of everyone else in the Mario mythos. Is that worth nearly $3,000? Probably. Do we have $3000?Nope. Click up on the source link below for the fully-in-Japanese details, but be warned that the related items on this listing are not safe for work. While the Oculus Rift is currently the world's great hope for a future lived inside digital spaces, it's not the first stereoscopic box developers have asked us to cram our faces into. For most of us, that honor goes to Nintendo's Virtual Boy, herald of vectorized headaches (in 3D!) to 700,000 or so hopeful people with $180. If you're one of the lucky people with an Oculus Rift development kit, however, you can now recreate that ol' black-and-red magic with VBjin-ovr, a freeware Virtual Boy emulator for the Oculus Rift. As seen in this video from YouTuberCymatic Bruce, wherein VBjin-ovr is used to play the obscure first-person survival horror game Insane Mouse Mansion, the Rift primarily functions as a head-mounted display, as Virtual Boy games have no use for the device's various bells and head-tracking whistles. Still, the experience seems about as accurate as one could hope for without the real deal. Is there an Excedrin emulator out there? You'll enjoy Faceball on your Virtual Boy soon! A lot is happening at the moment related to Bulletproof Software's unreleased "Faceball" game for Virtual Boy, thanks to some noble souls going to great lengths to do great things for the community. To make a long and twisted story short: an about 80% complete prototype of the game has been in private hands for many years, but last September, everything changed when detailed descriptions of said prototype had been posted on our forum by Japanese "Mr. G". A bit later, the prototype had found its way into the hands of Virtual Boy enthusiast and PVB member bigmak, who has successfully dumped the cartridge by now and is going to release the ROM for free later this year! To recoup a part of the five-figure(!) sum spent to make all this possible, a special fundraiser is going to happen soon, in which people will have a chance to show their support for bigmak and receive complete, boxed reproduction copies of the game in return! Check out the respective thread in our forum for all the yummy details. Even more goodness is added by the fact that substancial progress has already been made by thunderstruck in hacking the game. Chances are good that the game will eventually be completed by fans and released in a special edition. Find all the info in our forum here. Welcome to the DCEmu Homebrew and Gaming Network. This Network of sites is owned and ran by fans of all games consoles, we post news on all the consoles we cover about hardware aspects, gaming and Homebrew. Homebrew and Emulation are software thats made using free and legal tools to play on games consoles. This Network is the only worldwide network of sites where coders can upload and post comments they deserve for all their hardwork. We have a Network that currently supports PSVita, WiiU, Nintendo Wii, Xbox360, PS3, PS2,PS1, Snes, N64, Gameboy, Nes, Xbox, Gamecube, Nintendo DS, PSP, GBA, Dreamcast, Sega Saturn,3DS, DSi, Switch, PS4, Pandora, xboxone, GP2X, iPhone, Windows Phone, iPad, Android and also Mobile Phone Emulation. When new consoles appear we will expand to cover those consoles. We also cover Theme Park News and news and reviews of Beer, cider, lager, wines and spirits. news of their own releases and get the credit and Please help DCEmu become stronger by posting on the forums every day and make our community larger. All times are GMT +1. The time now is 02:04.